We’ve been visiting the Delta Queen at Chattanoga in August 2013, stayed a night on board, took a lot of pictures and tried to deal with our strong and mixed emotions seeing the proud paddlewheeler sitting on idle instead of plowing along the rivers – which she hopefully will be able to do very soon, again. It was great to see that she’s in a relatively good condition, given the fact that she wasn’t running for about five years now. For all her fans who are not able to visit the Delta Queen at Chattanooga or haven’t seen her for a while, we took many pictures – and even Delta Queen experts might find a few sights they have never seen before as we were able to also explore her boiler room and the lower level of the engine room. Please check our comprehensive image gallery at our German website for all the pictures: Delta Queen picture gallery at cruisetricks.de (thought the website is in German, you’ll easily find your way around, as pictures are pretty international anyway). 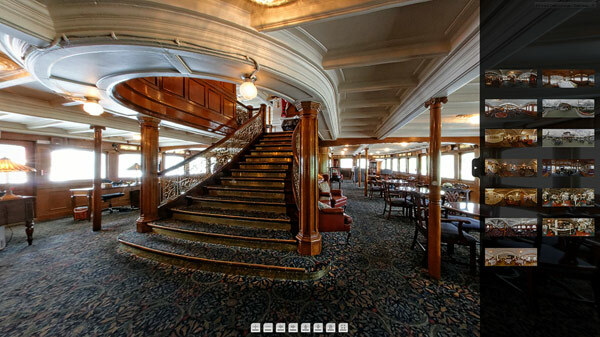 We also did something very special: 360° panorama pictures for you to explore the Delta Queen interactively. Check out the Delta Queen panorama pictures at steamboats.org (preview, see the picture below). Mayor Andy Burke has taken it upon himself to force her to move. She is more of a part of Chattanooga than he is! Call his office, email, to stop this. How many millions of $$ was given to VW in tax breaks – they can’t find something, a subsidy for her, for back rent? She is NOT an eyesore – whomever made such a statement must have ulterior motives.